Private 2-floors country house for touristic rent, with 2 bedrooms and 1 bath. Badinot house is a two - floors indipendent countryhouse sited in the village of Diano d'Alba, a beautiful place in the heart of the Langhe. Diano is one of the best villages in the Langhe areas, in fact is a very fascinating place sited in a central position between Alba (really close), Barolo and Barbaresco; its position offers a beautiful view on the hilly landscapes !! 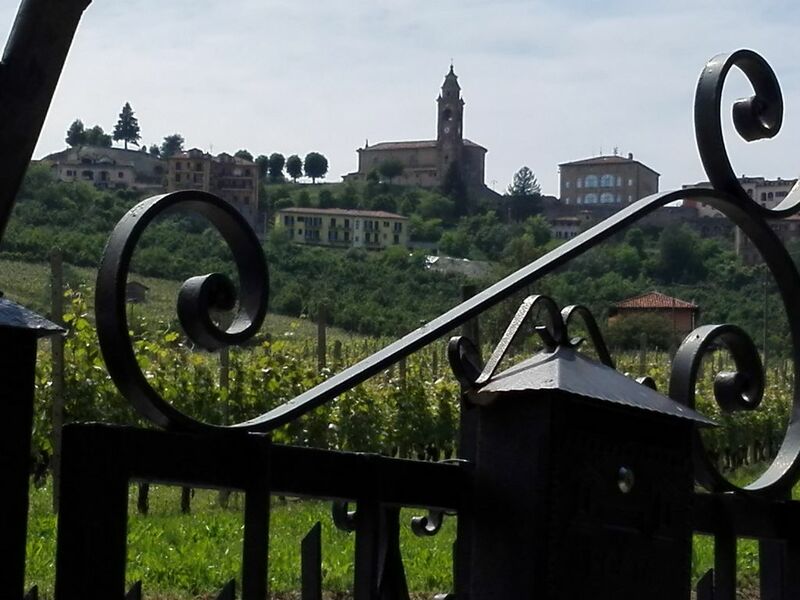 The city of Alba is just 6 km away from Badinot, and Barolo is no longer than 10 km, on a very interesting panoramic road !! ..
1 large KITCHEN / DINING ROOM with fridge + freezer, gas oven, toaster, kettle, American coffee machine, Italian coffee machine, washing machine, microwave, all you need for breakfast and for cooking .. and a big table with 6 seats. 1 LOUNGE ROOM with a comfortable leather sofa, a wood - fireplace, hi fi, wine tasting corner, DVD player, TV with Italian digital terrestrial and satellite channels from GER, CH, FRA, ITA, AUT. 2 BEDROOMS, the blue one is bigger and contains a king size double bed (181 x 200 cm) and could be equipped with a third single bed or a cot for kids (we have 2 cots); the green one is smaller but very romantic, with a double canopy bed (160 x 200 cm), That is perfect for a couple or for children, too. Both rooms include linen and clothes. 1 BATHROOM with water closet, bidet, sink, shower, hair dryer, soaps and bath products, linen and towels. 1 gazebo with chairs for outside. 1 round table with four comfortable seats. 1 GARDEN VEGETABLES and FRUIT TREES to gather what the nature offers in That season. 1 private flowered LAWN, adjacent to the dining room, large and closed, where children and animals may play safely. Badinot house is a two-storey house, independent, located in the municipality of Diano d'Alba, a beautiful place in the heart of the Langhe. 1 KITCHEN / DINING ROOM complete with fridge freezer, oven 5 burner gas stove, microwave, coffee makers, toastiera, electric kettle, mixer, washing machine, pots and pans ... and a large table with 6 seats. 1 LIVING ROOM with fireplace, Italian digital terrestrial and satellite TV (foreign language channels), dvd player, tasting corner, stereo, leather sofa. 2 bedrooms, the blue one, very spacious, has a king size double bed and may include a third single bed (possibly two beds for children). The green room, smaller but romantic, includes a four-poster bed, perfect for a couple but also for children. The bed linen and towels are provided. 1 bathroom with toilet, bidet, shower, hair dryer, towels and linens. September 1 BBQ, with grill, soapstone and cutlery for grilling. PRATO 1 spacious suite, adjacent to the dining room, large and closed, where to play children and animals safe from harm. In the evening you can dine out and then enjoy the silence, the coolness of the evening and the stars, far away from city traffic, two antique street lamps illuminate discreetly charming location and the crickets will accompany your chats. My name is Gabriella, I am a nurse and mother of 2 sons and a daughter; I actually live and work in Alba, the city where I was born. My job and my life prepared me about making people feeling fine and so I think I am able to make you feel welcome!!... I love people (especially children), nature (especially hilly areas like Langhe, and the seaside, too), reading and music. Bathroom is between the bedrooms, at first floor. It's been re-newed in 2016. Linen and towels are included. Condensing boiler. Radiators with an only thermostat. fireplace. Hi fi. Dvd player Brochure and advertising cards. Leather sofa. Tasting corner. Gabriella provided great advice on what to see and do in the region as well as providing some food and drinks to help us settle in. chairs to sit in, and to my daughters delight a garden shower (which she used to cool off). In the near vicinity you can do minor shopping and you can have dinner near the central square (steep uphill walk to diano d’alba). Also quite some opportunities for sightseeing of the lovely villages like La Morra, Monforte d’Alba, Nieve, Barolo an of course Alba itself. last but certainly not least: Gabriella is a wonderful host who takes care of your every need. Truly recommended! It's a privilege to share our experience with you. When we arrived Gabriella and Lorenzo greeted us with a bottle of prosecco. They graciously opened their home and welcomed us to experience Piedmont. What I appreciated most about our time was we were able to relax and dial back from the busyness of work because of the comforts provided. Their home is driving distance from Alba and a short uphill walk to Diane d'Alba, surrounded by vineyards. For a brief time we felt as though we were part of Piedmont . Gabriella and Lorenzo anticipated our needs - the kitchen was well stocked with Local provisions, including produce (tomatoes and figs) and homemade jam from their garden. Aside from the daily indulgences of Italian cuisine, we were able to do laundry and work remotely with excellent connectivity. We had originally planned to stay for 3 nights, however we extended our visit to 6 nights. We simply couldn't bring ourselves to leave. I would strongly encourage you to consider this unique gem. The scenery is beautiful, the home is clean, spacious and thoughtfully arranged, most importantly, Gabriella and Lorenzo are most generous and attentive hosts. tutto molto pulito, la cuccina molto buon fornita, anche sale, peppe, olio, aceto, tutto ero li. Gabriella e molto gentile, abbiamo avuto delle giornate bellissime a Casa di Badinot. Anche il giardino et ben coltivato. Dietro la casa la che un bosco, una meraviglia. Grazie mille Gabriella. Spero a un altra volta. The remaining payment of 75% can be made in cash upon arrival at the house We do not ask for any money for the final cleaning of the house; the same will be done personally by the owner. Of course the house will be left in a decent way We do not ask for a deposit for damages because we trust our guests. We are sure that they will be respectful, but if they would cause a damage, we expect they will decide with us a price for replace the broken object(s) and eventually give us the money during the check-out. Touristic rent may not lasts more than 28 consecutive days. Il restante pagamento pari al 75% dell'ammontare potrà essere pagato in contanti all'arrivo presso la nostra casa Non chiediamo alcun soldo per la pulizia finale dei locali; la stessa verrò effettuata personalmente dalla proprietaria. Naturalmente la casa andrà lasciata in modo decoroso. Non richiediamo una caparra per eventuali danni perchè abbiamo fiducia dei nostri ospiti. Siamo sicuri che saranno rispettosi, e nel caso in cui dovessero arrecare danni, ci aspettiamo che siano disponibili a discutere insieme a noi un prezzo per gli oggetti da sostituire ed eventualmente, dare la somma pattuita durante il check-out. L'affitto turistico non può perdurare oltre i 28 giorni consecutivi.